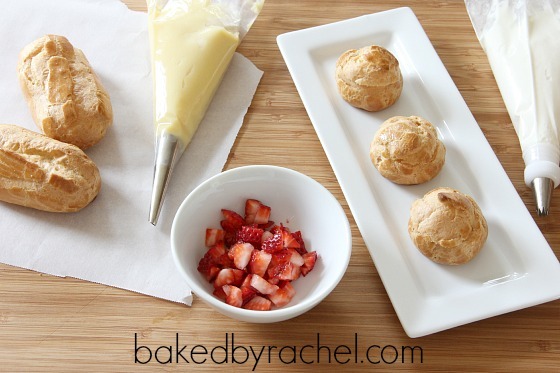 A simple pâte à choux recipe. A light and easy pastry dough perfect for making traditional éclairs and cream puffs. I love cookbooks, especially pretty cookbooks with lots of drool inducing photos and tempting recipes. 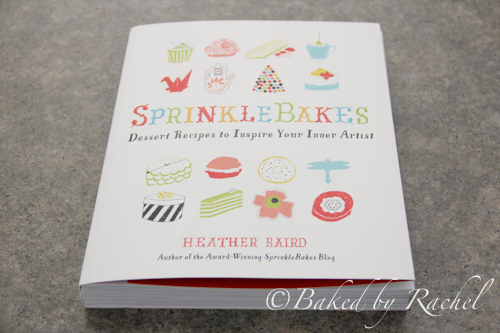 When I heard that Heather had a cookbook coming out I knew it would be just as amazing as her blog, also titled Sprinkle Bakes. She’s always posting over the top desserts that I couldn’t even dream up if I tried. To my delight, I was given the opportunity to review her book… and give one copy away! It was hard to choose which recipe to make first from this beautiful book. I wanted to bookmark so many but a few spoke to me even more than others. Macarons and pâte à choux were tied for top pick. When I told the Mr what I was deciding between, it was no longer a debate. He wanted cream puffs or éclairs. The dough was incredibly easy to whip up and they puffed up beautifully in the oven. They weren’t all perfect, but being my first time I’m extremely pleased with the results and plan to make them again with all kinds of dreamy fillings and toppings. 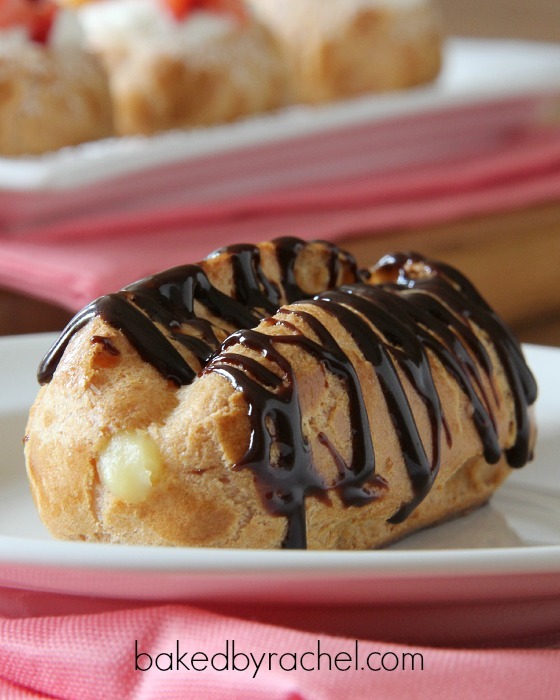 For this little endeavor, the éclairs were filled with a traditional pastry cream and drizzled with chocolate sauce. I cheated and used hot fudge sauce meant for ice cream. Shortcuts can be great, as long as they’re still tasty and this absolutely was. 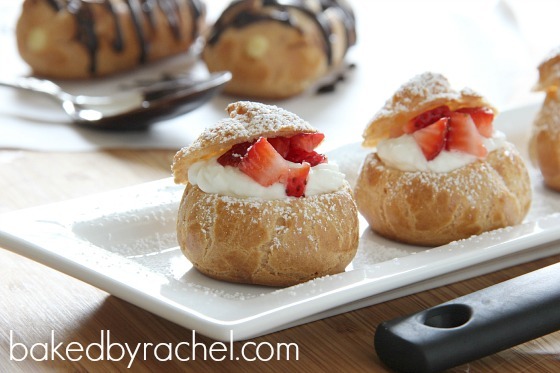 The cream puffs were filled with homemade whipped cream and chopped strawberries, then dusted with powdered sugar. Those were my favorites, so light and sweet. Amazing. You need these in your life. Originally I planned on halving the recipe so I wouldn’t have a ton of pastry shells lying around. At the very last minute I decided to go all in and make a full batch. Best call ever. Yield: Yields roughly 30 cream puffs or 12-15 éclairs. A light and easy pastry dough perfect for making traditional éclairs and cream puffs. Preheat oven to 425 degrees. Prepare two baking sheets with parchment paper or silicone baking mats. Fit a pastry bag with a large round tip or plan to just snip off the end, a large plastic bag may also be used. In a medium saucepan over medium heat, combine water, butter, sugar and salt. Bring to a boil, stirring occasionally. When mixture begins to boil, remove from heat. Sift in flour. Return to heat and stir until dough mixture pulls away from the sides of your pan. Transfer dough to a medium bowl or stand mixer fit with a paddle attachment. Mix for several minutes to cool slightly. Mixing on low, add one egg. Mix until dough pulls apart and resembles mashed potatoes. Continue this method until all 4 eggs have been mixed in. Transfer dough to your pastry bag or large plastic bag. 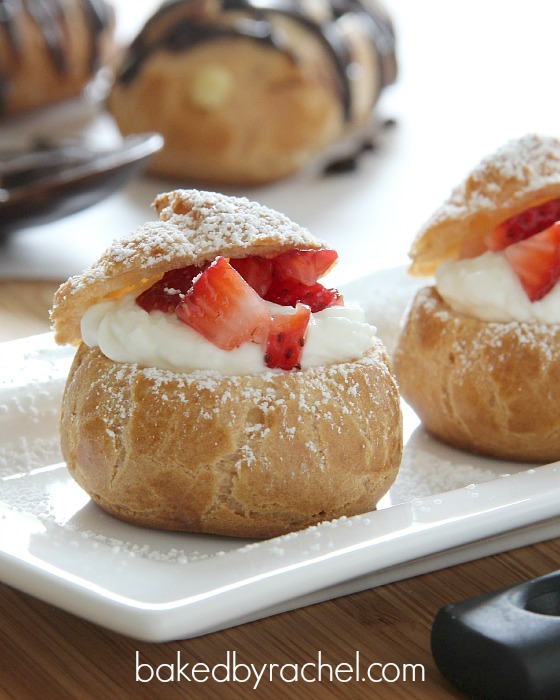 For cream puffs, pipe mounds roughly 1" around. For éclairs, pipe strips 1"x4". To remove peaks, dip your finger in water then gently tap on dough. In a small bowl, beat one egg with a pinch of salt. Brush egg wash over piped dough. Bake for 10 minutes at 425 degrees, then reduce the heat to 350 degrees and continue to cook for 10 more minutes. Transfer to a wire rack to cool. In a small bowl, dissolve cornstarch in 1/4 of milk. Beat 1 whole egg into milk mixture, followed by 1 egg yolk at a time. In a small saucepan over medium heat, bring remaining 3/4 milk and sugar to a boil. Whisk constantly. When mixture begins to boil, while whisking constantly, slowly add 1/3 of the milk mixture into your egg mixture. This will help temper the eggs so they don't scramble when you add them to the hot milk. Returning the saucepan to medium/low heat, begin slowly pouring egg mixture into saucepan, stirring constantly. Whisk until mixture begins to boil and thicken. Remove from heat, add in butter and vanilla. Transfer to a clean bowl. Cover with plastic wrap, pressing down to pastry cream so to avoid forming a crust. Chill until ready to use. In a medium bowl with an electric hand mixer, beat heavy cream, powdered sugar and vanilla. Begin on low speed to avoid splatter, gradually increase speed until you are beating on high. Mix until thick. Cover and transfer to refrigerator until ready to use. Using a serrated knife, slice off the top 1/3. 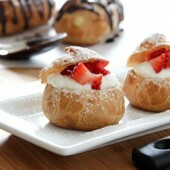 Using a pastry bag, plastic bag or spoon, fill cavity of cream puff with whipped cream (or other desired filling). Add chopped strawberries, replace top and sprinkle with powdered sugar. Serve immediately. Add pastry cream to a piping bag fit with a long tip. Carefully pierce the end of your éclair with piping tip, fill with pastry cream. Drizzle with chocolate sauce. Serve immediately. Details: One reader will win one copy of Sprinkle Bakes, courtesy of Sterling Publishing. Giveaway will run from May 28th, 2012 – May 31, 2012. Contest only open to US residents. Winner will be randomly selected and emailed. Winner has 48 hours to respond or another winner will be chosen. Main entry must be completed or extra entries will not count. Right now my favorite dessert is chocolate cheesecake! 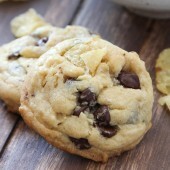 I liked Baked by Rachel and Sprinkle Bakes on Facebook! Creme Brulee, with berries on top! My favorite dessert is pretty much anything that involves lots and lots of chocolate – Julia Childs’ chocolate mousse might be THE favorite! I like both Baked by Rachel and Sprinkle Bakes on Facebook! My favorite dessert is a vanilla malt with extra vanilla and extra malt. Mmm! My mother in law makes to die for peach pie! My favorite dessert at the moment is probably fresh fruit with soy yogurt (lactose free) and granola. I know it is a little boring, but where I am it is hot now! My favorite dessert is caramel apple pie with vanilla ice cream. Favorite dessert? Only one? LOL Schwartzwalder Kirschtorte -minus the buttercream 9/10 times I’ll choose any chocolate dessert offered over all the rest. 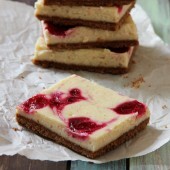 I love cheesecake also…in any form. I follow Baked by Rachel and Sprinkle Bakes on Twitter. I know the giveaway is over, but I just wanted to say your pictures look awesome!!!! Seriously, you did such a great job! 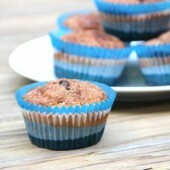 This recipe looks fabulously delicious! I need to get this cookbook. I, too, love cookbooks. This looks so totally creamy and perfect. Thanks for sharing this find. This recipe is amazing. Now I don’t have to go to the restaurant to enjoy this I can do it at home. Thanks for this recipe!